Imputed righteousness is a concept in Christian theology that proposes that the "righteousness of Christ ... is imputed to [believers] — that is, treated as if it were theirs through faith." :106 It is on the basis of this "alien" (i.e. from the outside) righteousness that God accepts humans. This acceptance is also referred to as justification. Thus this doctrine is practically synonymous with	justification by faith. The teaching of imputed righteousness is a signature doctrine of the Lutheran and Reformed traditions of Christianity. 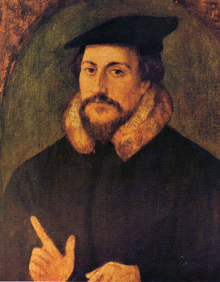 There is some dispute as to the origin of the reformation era concept of imputed righteousness. Some modern Lutherans deny that Luther taught it before other reformers such as Melancthon. However, Luther did use the term in this sense as early as 1516. In his seminal 1516 Novum Instrumentum omne (actually finished late in 1515 but printed in March 1516), Erasmus rendered the Greek logizomai (reckon) as "imputat" all eleven times it appears in Romans chapter four. The Vulgate Erasmus intended to "correct" usually rendered it "reputat" (repute). Erasmus was at this time famous and Luther almost unknown, leaving open the possibility that the concept itself did not originate with Luther, but rather, if not with Erasmus, then within the wider church reform movement. Discussion of these concepts are complicated by different definitions of key terms, such as "justification" and "grace". Imputed righteousness is the righteousness of Jesus credited to the Christian, enabling the Christian to be justified. Double imputation refers to the imputation of believers' sin to Christ and the imputation of Christ's righteousness to believers. It is closely related to the Reformed doctrine of justification by grace through faith alone. Passages like 2 Corinthians 5:21, are employed to argue for a dual imputation – the imputation of one's sin to Christ and then of his righteousness to us. Infused	righteousness, by contrast, can be described as: "In Augustine's view, God bestows justifying righteousness upon the sinner in such a way that it becomes part of his or her person." Imparted righteousness, in Methodist theology, is what God does in Christ by the power of the Holy Spirit after justification, working in the Christian to enable and empower the process of sanctification (and, in Wesleyan thought, Christian perfection). John Wesley believed that imparted righteousness worked in tandem with imputed righteousness. Starting with Augustine, the Roman Catholic tradition has understood justification as the entire process by which God forgives and then transforms Christians. Based on their reading of the use of "justification" in Paul's letters, the Reformers took justification to refer specifically to God's forgiveness and acceptance. The term "sanctification" was used to refer to the lifelong process of transformation. Thus the Roman Catholic term "justification" effectively includes both what Protestants refer to as "justification" and "sanctification." This difference in definitions can result in confusion, effectively exaggerating the disagreement. However the difference in definitions reflects a difference in substance. In the Protestant concept, justification is a status before God that is entirely the result of God's activity and that continues even when humans sin. Thus using different words for justification and sanctification reflects a distinction between aspects of salvation that are entirely the result of God's activity, and those that involve human cooperation. The Roman Catholic tradition uses a single term, in part, because it does not recognize a distinction of this type. For the Roman Catholic tradition, while everything originates with God, the entire process of justification requires human cooperation, and serious sin compromises it. Both imputed and infused righteousness agree that God is the source of our righteousness, and that it is a gift that humans cannot deserve. Both models agree that God's activity results in humans being transformed, so that over time they become more obedient to God, and sin is progressively defeated in their lives. At times this agreement has been obscured, with Protestants accusing Roman Catholics of believing that humans can earn salvation, and Roman Catholics accusing Protestants of believing that Christians need not have their lives transformed. According to imputed righteousness, the righteousness by which humans are made acceptable to God, remains "alien." Since their acceptability is based on God's actions, nothing humans do can forfeit their status as accepted. Sin can result in God treating them as disobedient, but not in God disowning them. Protestants differ on the question of whether it is possible for humans to forfeit justification. But if they do, it is by ceasing to have faith in God, not by any individual sin. Roman Catholics hold that righteousness comes to be present in humans, and that the continuing status of acceptance is based on this. Humans have a responsibility to cooperate with God in maintaining and strengthening the presence of this "grace" in their lives. Certain serious sins (called "mortal sins") can result in its loss. Protestants have avoided speaking of humans as having any "merit" before God. Because all justifying righteousness is alien, humans do not deserve anything good from God. Because Roman Catholics hold that righteousness comes to be present in humans, humans can in a certain sense merit reward. Of course any such merit is ultimately due to God's activity. What is meant by righteousness? The concepts here are nominally derived from the letters of Paul the Apostle (particularly the Epistle to the Romans), which form a large part of the Christian New Testament. However the concepts have been filtered through the concerns of later Christian theology. From at least the time of Augustine of Hippo in the 5th Century, "righteousness" has been seen as a moral and religious quality. In the Roman Catholic model, Christians are transformed by God's action, developing a righteousness of their own. In the 16th Century, the Protestant Reformers came to understand human acceptance by God according to a "forensic" model, in which God declares humanity not guilty, even though they were in a moral sense still guilty of sin. However, the Reformers continued to accept the traditional concept of righteousness. What changed is that the righteousness was seen as Christ's, which was credited ("imputed") to Christians by God. Starting in the middle of the 20th Century, increased knowledge of first Century Judaism has produced a reassessment of many of the concepts with which Paul was working. Many scholars now see "righteousness" as a Hebrew concept referring to fidelity to God's covenant with humanity (for God) or the status of being a proper member of that covenant (for a human). If this is correct, then righteousness is a status, not a quality of religious/moral perfection. This section is a precis of N. T. Wright's work in "What Saint Paul Really Said". Wright, one of the best-known advocates of the New Perspective on Paul, teaches that "righteousness of God" and "righteousness from God" are distinct concepts that have been confused and conflated in the past. He relates the court-room metaphor, pointing out that there are three parties in the Hebrew court - two parties in disagreement and one judge (there is no "Prosecuting Attorney"). The judge decides the dispute between the parties declaring one to be correct and the other incorrect. The one who is declared "correct" in court is called "righteous" in the matter that was judged. The "righteousness of God", referring to God's (the judge's) faithfulness to the covenant relationship, can be neither imputed nor imparted to anybody but refers only to his role as judge. "Righteousness from God" is roughly equivalent to "vindication", meaning that God is pronouncing that particular party to be correct/vindicated/righteous/acquitted in their dispute with the other party. The dispute in question in Christian theology is between the those of faith (in God's promises: the covenant, the Messiah), and "the wicked," meaning everyone else. Paul posited that the people of such faith are vindicated when Messiah returns, being declared "righteous" (or in other words, vindicated for their stance), which is exactly the meaning of the Biblical term "justified", in Wright's view. This means that we do not "receive" the righteousness of God (or as often expressed, "of Jesus"), as in the classical Evangelical vernacular, nor is it "infused" as in the classical Roman Catholic vernacular. The "righteousness of God" remains His alone, and our "righteousness from God" means that we are found to be "of" the people of God. Paul's argument is that it has always been so, but what has changed is that the Messiah, in Jesus of Nazareth, has now appeared. An important verse to note is 2 Cor 5:21, "For our sake he made him to be sin who knew no sin, so that in him we might become the righteousness of God" (ESV), which has traditionally been interpreted to mean that the Christian has, in some way, become righteous (by impartation or imputation), in exchange for Jesus' sinlessness. Moreover, Wright says, Paul is speaking here of the apostles, and pointing out that in their role as apostles, their activity is effectively God's righteousness (covenant faithfulness) in action ("we are ambassadors for Christ, God making his appeal through us. We implore you on behalf of Christ, be reconciled to God" - v 20). This meaning is natural when taken in context from verse 11 through 21. Imputed righteousness is the Protestant Christian doctrine that a sinner is declared righteous by God purely by God's grace through faith in Christ, and thus all depends on Christ's merit and worthiness, rather than on one's own merit and worthiness. On the one hand, God is infinitely merciful, "not wishing for any to perish, but for all to come to repentance." (2 Peter 3:9) ----- though this passage is often interpreted by many Protestants as referring only to Christians, as the context of the epistle indicates that Peter's audience were believers, and the first half of the verse indicates that the promises of God to believers are not late but patiently enduring the unfolding of history as God sovereignly saves His own through time. On the other, God is infinitely holy and just, which means that he cannot approve of or even look upon evil (Habakkuk 1:13), neither can he justify a wicked person (Book of Proverbs 17:15). Because the Bible describes all men as sinners and says that there are none who are righteous (Epistle to the Romans 3:23, 10) this is a classic theological tension. To use the words of St Paul, how can God be "just and the justifier of those who believe (Rom. 3:26)?" Through this argument, God cannot ignore or in any way overlook sin. Adherents say that God the Father resolves this problem by sending Christ, who is sinless and indestructibly perfect in character, to lead a perfect life and sacrifice himself for the sins of mankind. The sins of the repentant sinner are cast onto Christ, who is a perfect sacrifice. First of all, they note that the New Testament describes the method of man's salvation as the "righteousness of God" (Rom. 3:21, 22; 10:3; Philippians 3:9). They then note that this imputed righteousness is particularly that of Jesus Christ (2 Corinthians 5:21; 1 Corinthians 1:30). When they refer to the "imputed righteousness of Christ," they are referring to his intrinsic character as well as his life of sinlessness and perfect obedience to God's law on Earth, usually called his active obedience. The need for a human life of perfect obedience to God's law was the reason that Christ, who is God, had to become incarnate (take on human flesh) and live as a human being. Paul's statement in Romans 4:6, that God "imputes righteousness apart from works," is the basis for the fourth step in the argument that this righteousness of Christ is imputed to the believer's account. By this terminology, they mean that God legally credits the believer with the righteous acts that Christ performed while on this earth. Luther uses the language of a "fortunate exchange" to describe this concept, borrowed from St Paul's imagery in Colossians 3. Christ trades his "garments," holiness, righteousness, being blessed by God the Father, in exchange for human sin. This is really good news for sinners - Christ takes their sin and believers receive His blessed condition and righteousness. This righteousness of Christ and its relationship to the recipient can also be likened to adoption. Adoption legally constitutes a child the son or daughter of a person that is not that child's birth parent. Similarly, in marriage the married partners are considered one entity legally. When a sinner believes in Christ, he or she is spiritually united with Christ, and that union makes it possible for God to credit believers with the righteousness of Christ without engaging in "legal fiction." Many Christians, most notably of the Catholic tradition, believe that when God declares someone righteous in Christ he actually makes that person righteous. This, therefore, means that someone is now infused with the righteousness of Christ. Christ's righteousness is a present reality, but it is in the form of that persons own righteousness. Catholics contend that the final interpretation of scripture falls to the historical Catholic Church (collectively known as the Magisterium); in particular the opinions of the early Church Fathers - many of whom held opinions on justification before the closure of the Christian Canon. Therefore, the more recent Protestant understandings of the Greek word δικαιοο is not only seen to be in error lexically, but also historically. Catholics contend that the Greek word δικαιοο means "to do justice" "to have justice done" (Thayer's Lexicon) or "to satisfy justice." The 1968 Supplement of Liddell Scott and Jones also includes the definition, "brought to justice"; the noun means "justice." The Greek noun Πιστις means "faithfulness" (BDAG, definition 1A), and the verb form means "faithfully trust." The Greek noun νομος means a "norm" (BDAG, def. 1). Using this interpretation of the Greek, the doctrine of "justified by faith" = "declared righteous by our faith" as purported by many Protestants falls apart. The argument against imputed righteousness in the here-and-now is that the Gospel shows "justice is done by Christ's faithfulness" in doing the work of atonement on the cross. The Protestant doctrine of imputed righteousness is also opposed by the doctrine of The New Church, as explained by Emanuel Swedenborg, and is thus closely aligned with the Roman Catholic tradition. The "imputation" of the Lord's merit is nothing but the remission of sins after repentance. According to Swedenborg, "Mention is often made in the Word of "the righteous," of "righteousness," and of "to be made righteous;" but what is specifically signified by these expressions is not yet known. ...It is believed by the heads of the church that he is righteous, and has been made righteous, who is acquainted with the truths of faith from the doctrine of the church and from the Word, and consequently is in the trust and confidence that he is saved through the Lord's righteousness, and that the Lord has acquired righteousness by fulfilling all things of the Law, and that He acquired merit because He endured the cross, and thereby made atonement for and redeemed man. Through this faith alone a man is believed to be made righteous; and it is believed further that such are they who are called in the Word "the righteous." Yet it is not these who are called "righteous" in the Word; but those who from the Lord are in the good of charity toward the neighbor; for the Lord alone is righteous, because He alone is righteousness. Therefore, a man is righteous, and has been made righteous, insofar as he receives good from the Lord, that is, insofar, and according to the way, in which he has in him what belongs to the Lord. The Lord was made righteousness through His having by His own power made His Human Divine. This Divine, with the man who receives it, is the Lord's righteousness with him, and is the very good of charity toward the neighbor; for the Lord is in the good of love, and through it in the truth of faith, because the Lord is Divine love itself." Philipp Melanchthon, a contemporary of Martin Luther, stressed the classic Lutheran desire to distinguish carefully and properly between Law and Gospel. In doing so he emphasized that Law binds, convicts, and drives people, while the Gospel proclaims repentance, the promise of grace, eternal life, and proclaims their liberty in Christ. 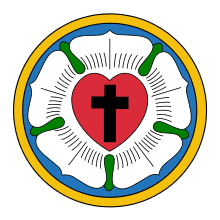 The Reformed and Presbyterian churches have generally followed the Lutherans on the importance of distinguishing the law and the gospel. Articulated in terms of Covenant Theology, law and gospel have been associated with the Covenant of Law (Mosaic, not to be confused with Covenant of Works, Adamic) and the Covenant of Grace, respectively. Historically, they have been more open to the broader biblical language the Lutheran Formula of Concord calls "correct" but not "proper." Recently, some prominent theologians have disputed the centrality of the law-gospel distinction in the Reformed tradition. "The Catholic idea maintains that the formal cause of justification does not consist in an exterior imputation of the justice of Christ, but in a real, interior sanctification effected by grace, which abounds in the soul and makes it permanently holy before God. Although the sinner is justified by the justice of Christ, inasmuch as the Redeemer has merited for him or her the grace of justification (causa meritoria), nevertheless he or she is formally justified and made holy by his or her own personal justice and holiness (causa formalis)." Although internal and proper to the one justified, this justice and holiness are still understood as a gift of grace through the Holy Spirit rather than something earned or acquired independently of God's salvific work. Put starkly, the Roman Catholic Church rejects the teaching of imputed righteousness as being a present reality. This is at the very center of the disagreements between Roman Catholics and Lutherans, and remains the primary sticking point to a unification of these traditions to this day. Many who hold to the doctrine of imputed righteousness reject the Roman Catholic teaching of gratia infusa (infused grace) because Lutheran and Calvinist anthropologies (see total inability) allow no room for the Roman Catholic concept of synteresis (a "spark of goodness"). In other words, the image of God is completely lost as a result of the Fall into sin (though cf. Gen 9:6 where murder is wrong because man is in the image of God after the fall). In regard to salvation, there is nothing in a sinner that is worth being redeemed by God, if based on the intrinsic merit or worth of the sinner. The necessity of imputed righteousness stems precisely from there being nothing internal onto which God's grace can be fused. Something altogether more radical must be done to make a sinner righteous; the sinful nature must be killed and replaced by a new nature made by God; "positional sanctification" is achieved through the divine declaration of imputation. 1 2 3 Mcgrath, Alister E. (1993). Reformation Thought: An Introduction. Oxford: Oxford University Press. ↑ See James Buchanan, The Doctrine of Justification (Carlisle, PA: Banner of Truth Trust, 1997), pp. 296-298, for a discussion of this topic. ↑ Craig, William Lane. "Doctrine of Salvation (Part 11)". Reasonable Faith. Retrieved 27 May 2014. ↑ Catechism of the Catholic Church, section 1861. ↑ Catechism of the Catholic Church, section 1856. ↑ Melanchthon, Philip, Apology of the Augsburg Confession, translated by F. Bente, and W.H.T. Dau, in Triglot Concordia: The Symbolical Books of the Ev. Lutheran Church. St. Louis, Concordia Publishing House, 1921. Part 23, Article 18, Of Free Will. From http://www.ctsfw.edu/bsmith-cts/etext/boc/ap/apol23.asc. ↑ Joint Declaration on the Doctrine of Justification, by the Lutheran World Federation and the Catholic Church. I have used the text at http://www.vatican.va/roman_curia/pontifical_councils/chrstuni/documents/rc_pc_chrstuni_doc_31101999_cath-luth-joint-declaration_en.html. Standard publication information is not given, but it appears to date from 1997. ↑ For this and the next paragraph, see McGrath, Alister, Iustitia Dei: A History of the Christian Doctrine of Justification. Cambridge: Cambridge University Press, 3rd Edition 2005. ↑ N. T. Wright, Justification: God's Plan and Paul's Vision. Intervarsity Press Academic, 2009 and N. T. Wright, What Saint Paul really said Eerdmans, 1997. ↑ N. T. Wright, What Saint Paul really said Eerdmans, 1997. ↑ John Piper's Counted Righteous in Christ (Wheaton, IL:Crossway, 2002), provides a good example of this answer. ↑ Millard J. Erickson, Christian Theology (Grand Rapids: Baker, 1999), p. 971. ↑ Swedenborg, Emanuel. The New Jerusalem and its Heavenly Doctrine, 1758. Trans. by John Whitehead, 1892, n. 18. ↑ Swedenborg, Emanuel. Arcana Coelestia, 1758. Trans. by John F. Potts, 1906, n. 9263. ↑ "Classical Covenant Theology". R. Scott Clark's Articles. 2007-05-16. ↑ "Law and Gospel". The Works of John Frame and Vern Poythress. 2007-03-30. ↑ "Sanctifying Grace". The Catholic Encyclopedia. 1913. Clifford, Alan C. (1990). Atonement and justification: English evangelical theology, 1640-1790: an evaluation. Oxford: Clarendon Press. p. 172. ISBN 0-19-826195-0. Murray, John (1955). Redemption Accomplished and Applied. Grand Rapids, Michigan: Eerdmans. p. 1–192. ISBN 978-0-8028-1143-1. Gundy, Robert H. (2005). The Old Is Better: New Testament Essays in Support of Traditional Interpretations. 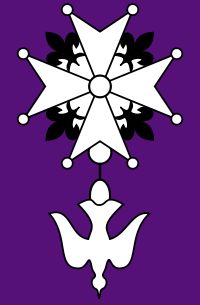 Tübingen: Mohr Siebeck. p. 250. ISBN 3-16-148551-3. Biblical Judgments and Theological Concepts: Toward a Defense of Imputed Righteousness, by Jordan P. Barrett, Scottish Bulletin of Evangelical Theology 32, 2014.